Mr. StarryNight and The Wizard Queen are and were your basic eccentric musician artist computer hustling American urban weirdo genius misfits. The Mr. was a serious record collector; serious to the point of having the Queen a bit concerned. There was no more room in the house. The Wizard Queen considered this, and did the deal, thinking that there were probably many others who felt similarly and were ready to sell their records,and that there were plenty of music lovers out there who wanted these gems. 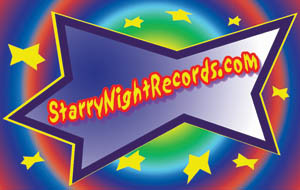 A successful test on the auction block confirmed this thought, and StarryNightRecords was born. As a side benefit, the Mr.’s passion for buying and hearing new material was satisfied without having to keep everything, and there was more space and peace in the realm of Mr. Starry Night and The Wizard Queen.